This Priest build will focus on using all magical support spells to help your party defeat enemy mobs or bosses in the game with less hassle. Your main job as a Full Support Priest is to make sure that your party will survive all fights! Refer below to determine which stats and skill build is best for your playing style. This is build highly recommended to players that doesn't have any network problems like game delays or lags. - Example: INT 3 : 2 VIT means for every 3 INT, you should aim for 2 VIT. Example: If you have 60 INT, you should aim for 40 VIT, or if you have 20 VIT, you should aim for 30 INT. Example: Go for 30 INT first then go for 20 VIT next, so in the end, you still have 3 INT : 2 VIT ratio. 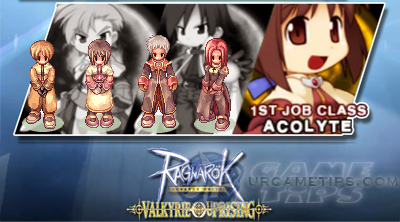 - INT: Increases your Magic Attack damage output, Heal, and Max SP pool. *Note: Builds are based from Skills, and Stats from equips/items that you will get later. 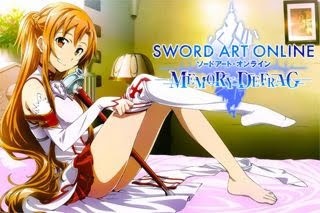 - Has the highest Heal value available with high SP pool (plus higher SP Regen). - Relies to spells, equips and items for survivability. - Holy Light will get massive Holy damage output too! - An optional build that has high Healing value with better survivability. your face!, giving you more time to heal yourself and your teammates. Sometimes, game delays and lag kills!, and this stat paired with Angelus will save you a lot, especially when your Heal is lagging too! - Pretty useful for mobbing monsters for your full AOE party! and pump all your points to INT to boost up your Heal. support other players, but if you followed this Battle Acolyte Build, use a Stat Reset item too then follow the FS Priest Stats build above and the following skill set. - Cure = Depends on where your party will grind most of the time. 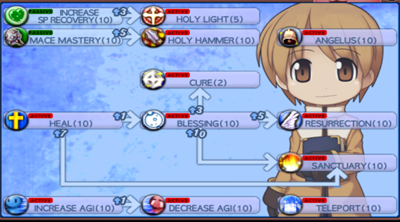 - Increase SP Recovery Lvl 3 = To unlock Holy Light. - Holy Light Lvl 5 = Your main Holy attack spell. - Cure = Depends on where you or your party will grind most of the time. - (MATK +) = More Holy attack Damage or Heal value = The more, the better. - (INT +) = The more, the better! - (MaxSP +) = The more, the better! default are considered Neutral in element, so cards like this will work well. - To effectively use your Holy Light skill, refer to this Elemental Property Guide. - (DEF + ) Physical Defense = The more, the better. - (Element Resistance +%) = Get what you can (depends on your grinding areas). - (MDEF +) Magic Defense = Just get what you can.